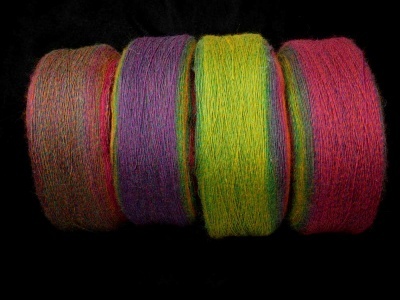 This is a side view of four of the Kunterbunts so you can see how each of this type of yarn might start from a different section of the colorway. 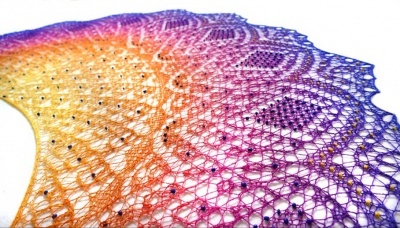 A close-up of Anna Victoria's original shawl, © Anna Victoria. Notice the beading? If you would also like two distinct colors of beads, let me know. 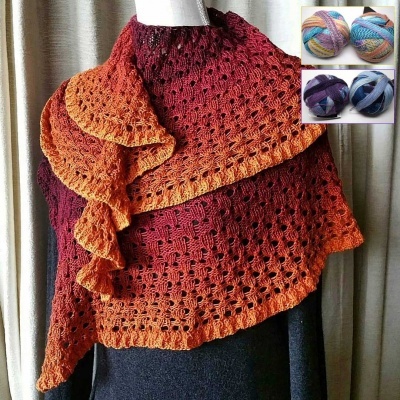 Another wonderful combination: A striking lace weight yarn with very long color runs plus a resizable beaded shawl pattern, so that you can knit it to the size and look you desire -- perfect! 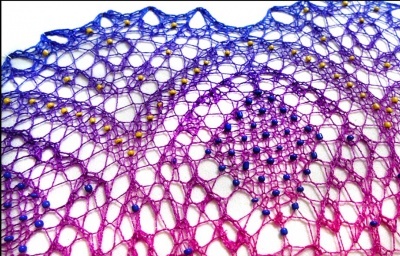 This Solar Sea Lace Shawl is by Anna Victoria, and is a crescent shape shawl knitted top down. It is light and lacey in the centre like the woven rays of light plus lots of beads towards the edge. The idea is to recreate the shores of the "solar sea." 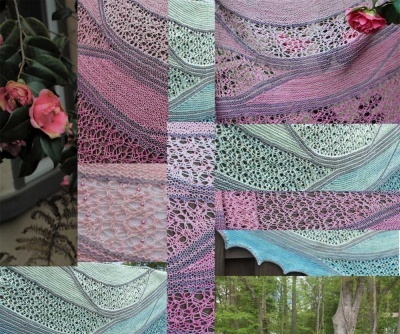 Make sure you get the pattern directly from Anna Victoria's Ravelry store. What we offer on this web page is the yarn and beads. This is a top down Crescent shape shawl. Multiple sizes are included in the pattern. And the amount of yarn will depend on the yarn used and gauge and size. The sample in the first photo used 475m, testers used between 375 and 900m, but larger versions are possible. The yarn we have for this is not the same as what Anna Victoria used in her original. This is a new creation from Schoppel called Lace Flower. 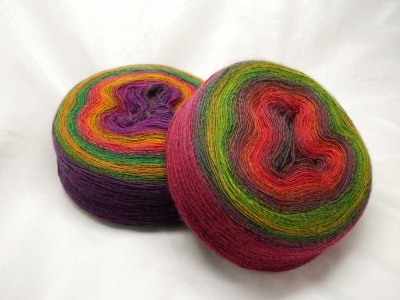 This is a strikingly lovely 100% superwash merino in an extra-large cake form. Each 150g cake has 1,312 yards. 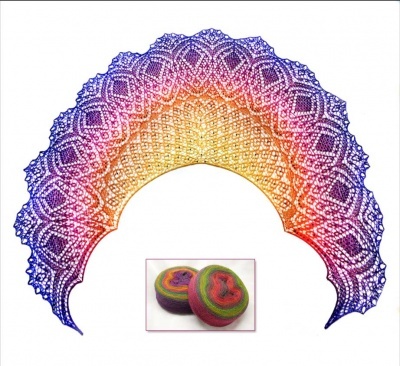 It is the same yarn as they had for so long in Lace Ball but here the full color repeat is in one cake. You will notice from the photos that some are wound from one section of the colorway and some from another -- though they look different, each cake has the same full color runs. Our photos show more than one in each screen so you could see how they might be wound -- your kit will have only one of these cakes of yarn. 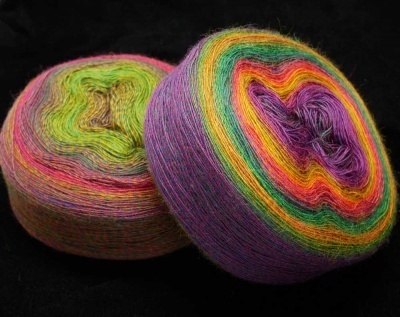 This colorway is called Kunterbunt (translates into Motley in English) and is a multicolored beauty with overall warmer tones. I see fuchsia and green, gold and lime, violet and orange, amber and golden brown. Not so much a galaxy as a universe of colors. The original shawl used 1,178 beads for the version you see in the photo. Our kits will give you more than you need, in size 8/0 (one 35g container, holding roughly 1400 beads) so you can play and enjoy. If you have an idea of what color beads you would like, tell me. Otherwise I will choose for you.